Justin Palardy was a professional Canadian football placekicker and is now on the Tigers coaching staff. He was drafted 36th overall by the Hamilton Tiger-Cats in the 2010 CFL Draft and was used as a punter. After being released by the Tiger-Cats, he was signed by the Winnipeg Blue Bombers as their placekicker, where he played for four seasons. Palardy also spent some time on the Ottawa Redblacks roster. In the 2010 season, he set the Blue Bombers single season record for place-kicking accuracy with 86.7%, a feat he would equal in 2012. Palardy attended Saint Mary’s University where he played university football for the Huskies as the team’s placekicker and punter from 2006-2009. He earned AUS All-Star kicker three times, twice as a punter and was named to the CIS 2nd All Canadian Team. Palardy also earned rookie of the year for both the AUS and SMU in 2006 and was named SMU MVP after the 2009 season. Justin is now a police officer with the Halifax Regional Police force and we’re delighted to have him join our staff for the 2018 season as a special teams coach and more. 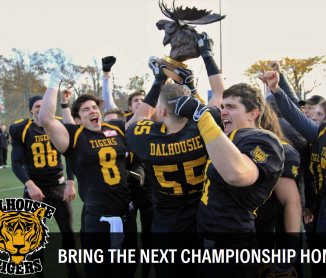 His knowledge of the game from his time in the CFL is a huge asset to the Tigers football program.